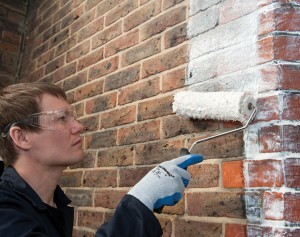 Damp Proofing your business or home is essential for both health and property protection. fit for human habitation’, which means that it’s safe, healthy and free from things that could cause you or anyone else in your household serious harm. For example, if your house or flat is too cold and you can’t heat it, this can affect your health. Safeguard Europe wanted to know what proportion of tenants were aware of their new rights and also to find out which building defects they had experienced which might render their home not ‘fit for human habitation.’ Working with leading pollsters, YouGov, they commissioned a poll of 1154 tenants in the UK who currently rent their home from a private landlord, housing association, or local authority. The top response was “Damp and Mould” at 51.48%, showing that this continues to be a major issue in the rented sector. This may be a reflection of the fact that previous attempts to improve the quality of rented accommodation (Decent Homes Standard, etc…) have tended to focus on housing associations and local authorities rather than the private rented sector. Although it is disappointing that 65% of tenants are unaware of the new Act, it is still early days as it only came into law a few weeks ago. Sadly, the fact that damp and mould topped the list of defects affecting rented properties came as little surprise. In many cases, these problems can be easily resolved through early intervention and regular maintenance. However there is a tendency to allow them build up until they become critical, at which point they can be more costly and complicated to resolve. Fitness for human habitation act. we will look at each of these groups and consider whether the cause is likely to derive from condition and design of the building itself or from the activities of the inhabitants. This category covers dampness that penetrates into the structure of the building, either from the ground or from rainwater. 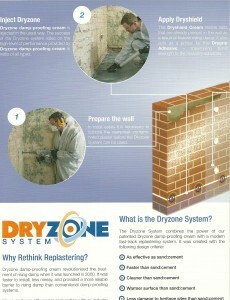 Examples include rising damp, rain penetration, groundwater penetration into basements and leaking roofs. Most structural damp issues occur due to lack of maintenance, poor detailing when buildings have been extended or modified or from buildings being poorly designed in the first place. For this reason, in most cases, it is reasonable to say that it is the responsibility of the landlord to ensure that this type of dampness is dealt with. With all of these examples, prevention is normally better than cure and it is a good idea to try and deal with them at the same time as carrying out other works to a building, in order to minimise costs. 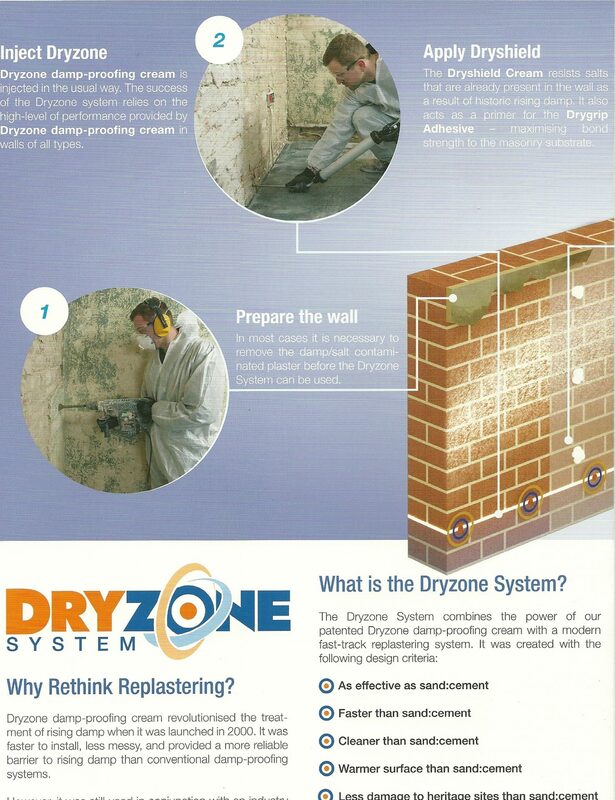 For example, if you are replastering a room in a building that doesn’t have a damp-proof course (DPC), installing a new DPC using Dryrod Damp-Proofing Rods at the same time is a simple and cost-effective intervention compared with having to deal with a rising damp issue in the future. Likewise, when a building is scaffolded for painting, always take the opportunity to look at the condition of the external walls and carry out any necessary repairs. As a second line of defence, consider the use of damp resistant plastering systems on internal walls. 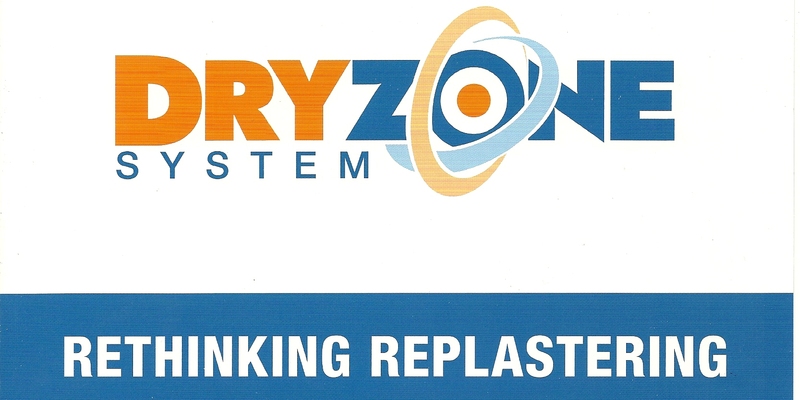 Standard gypsum-based plasters are very susceptible to moisture damage, but specialist plastering systems are now available that are specifically designed to resist dampness. Ascertaining whether fault lies with the landlord or tenant requires the use of a bit of common sense. Generally, if the fault has occurred due to lack of maintenance, the fault will lie with the landlord. In many cases, damage caused by escape of water will be covered under home insurance policies. Dampness caused by condensation, and the resulting mould problems, are likely to be the most contentious issue raised by the new Act. There are a number of factors that contribute towards condensation risk in buildings, some of which are likely to be regarded as the responsibility of the landlord. However, tenant behavior also plays a major role. Condensation occurs when moisture-laden air comes into contact with cold surfaces, causing the moisture within the air to condense into liquid water. Although it is a problem in its own right, it is the resultant mould growth that tends to cause the most concern. Due to their inherent design, some buildings are more susceptible to condensation issues than others and it can even affect modern buildings. Landlords can help minimise the risk of condensation by ensuring that walls are well insulated, as increased wall surface temperatures mean that condensation is less likely to occur. Supplying adequate ventilation is also essential, as it replaces moisture-laden air from inside the building with air from outside the building, which is actually drier throughout most of the year. However, for condensation problems to be resolved, a certain degree of co-operation from the occupants of a building will usually be required. Insulation measures will be of little use if tenants do not heat a building at all, which, sadly, is a common occurrence due to fuel poverty. Mechanical ventilation systems are also of little use if tenants turn them off, due to concerns about running costs or noise. Black mold, Its bad out there at the moment, that is for condensation problems, in your homes, especially when it leads to the black mold problems, fungi growing on the damp walls .behind wardrobes even under your beds, to cure the problem we have to look at good ventilation or insulation, usually both,as cold bridging of the external walls often causes the moisture in the atmosphere to condense on to the walls or ceiling, giving a perfect environment for the Black mould to flourish. Stachybotrys is a genus of molds, hyphomycetes or asexually reproducing, filamentous fungi, now placed in the family Stachybotryaceae. Historically, it was considered closely related to the genus Memnoniella, because the spores are produced in slimy heads rather than in dry chains. The spores are harmful, causing respiratory to young and old. 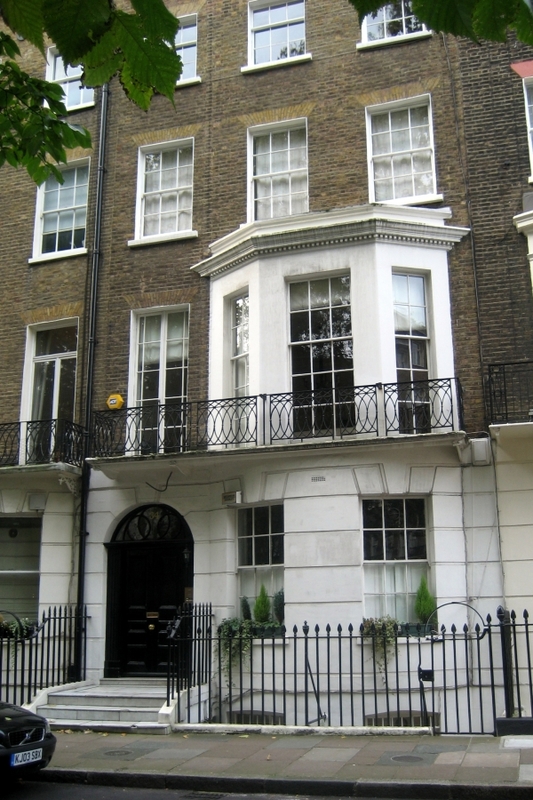 A poll carried out by YouGov on behalf of damp-proofing product specialists Safeguard Europe has found that 38 percent of people would withdraw an offer on a house that they were considering purchasing if it was discovered that it suffered from damp. Even where potential house buyers were prepared to continue with the purchase, a substantial discount would be expected to compensate for the cost of repairing the damp problems. 48 percent of respondents said that they would expect a price reduction with 18 percent expecting a price reduction of 20 percent or more – equating to more than £42,000, based on the June 2016 UK average house price of 213,927. According to Hudson Lambert, Managing Director of Safeguard Europe, the key message that comes from the survey is “Fix damp before selling”. We already knew that damp was a big turn off for potential house purchasers. However we were still surprised at the degree to which it affected purchasing decisions. The fact that so many people appear to be willing to walk away from a house purchase or expect a price reduction of tens of thousands of Pounds would indicate that people’s perception of the cost and difficulty of dealing with damp problems is overblown. In reality, most damp problems are relatively straightforward to deal with. Product developments such as damp-proofing rods and damp-resistant plaster systems have made the treatment of common forms of dampness easier and more reliable than ever before. Even in extreme cases where dampness is widespread in a property, it is rare for treatment costs to run into the tens of thousands. 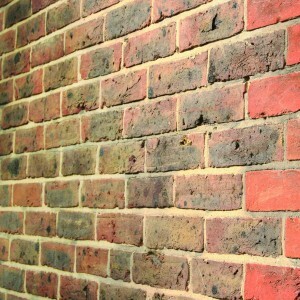 87% of people would be put off making an offer on a property if it suffered from damp problems. This topped the list ahead of Small Room Sizes (65%). 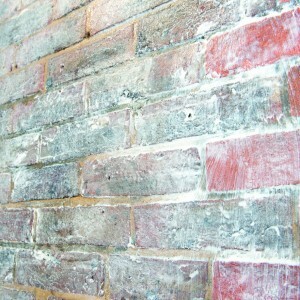 49% of people have experienced damp problems in a property that they have lived in. The top 5 damp-related issues that would deter people from putting an offer on a property were Mould & moss growth (76%), Damp patches and salt marks on walls (73%), Warping of timber (68%), Crumbling plaster or render (67%), and possible negative health effects (66%). More than 1250 UK respondants took part in the poll which aimed to find out what people look for when buying a new home. Approximately 60% were homeowners and 40% non-homeowners. The full data from the poll can be downloaded below (YouGov - All). The data is also available filtered into homeowners and non-homeowners. 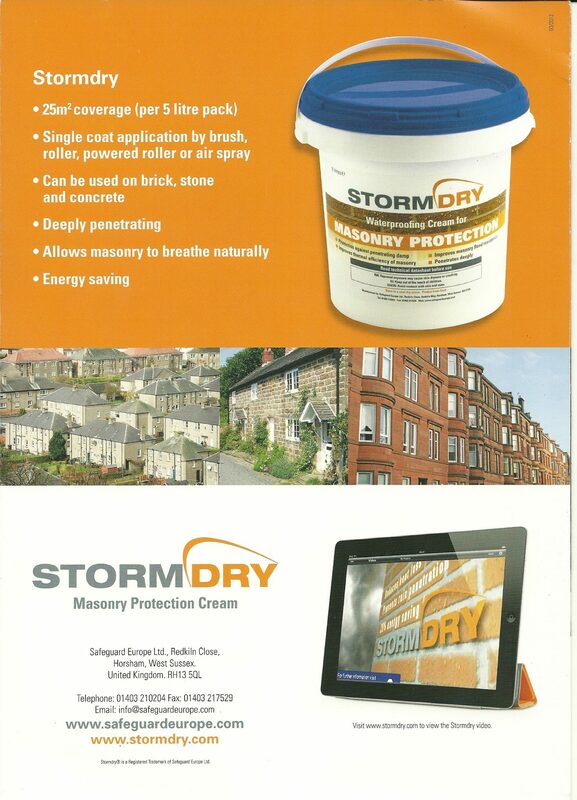 The British Board of Agrément, the UK’s foremost body for the testing and certification of construction products and systems, has granted certification to Stormdry Masonry Protection Cream after months of extensive testing. 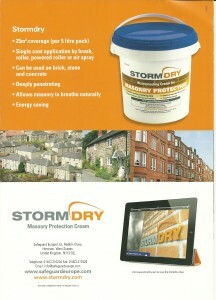 The certificate confirms that a single coat application of Stormdry will be effective for at least 25 years. The certificate (cert no. 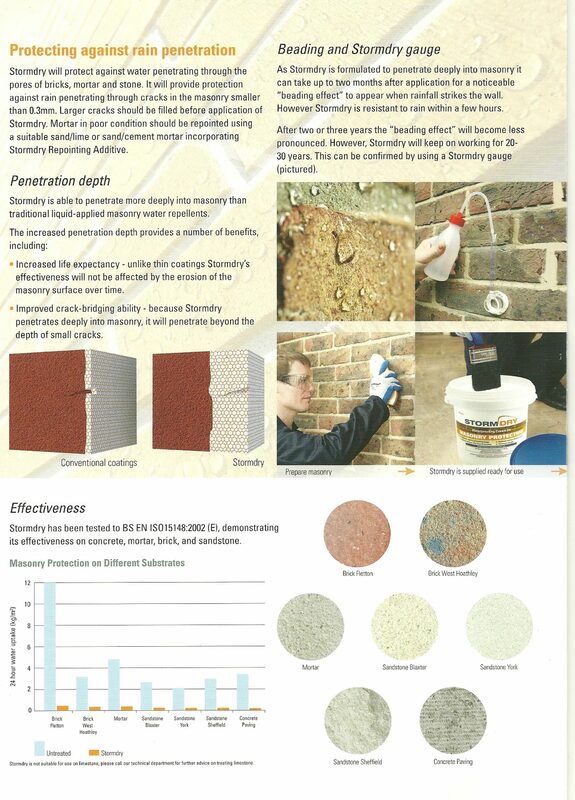 15/5198) covers not only Stormdry Masonry Protection Cream but also Repointing Additive No.1 and Repointing Additive No.2. The 25 year certification is in line with the performance requirements for insulation under ECO/Green deal, which Stormdry can help to protect. It is this kind of assured performance and durability that has lead Stormdry to be used by councils, trades people and homeowners alike. No other masonry water repellent offers the same BBA approved performance. For more information on exactly what is included in the certification, we recommend reading Stomdry’s BBA certificate. 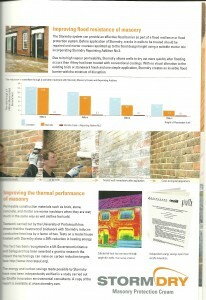 To see the BBA approved performance for yourself, ask for a free sample. 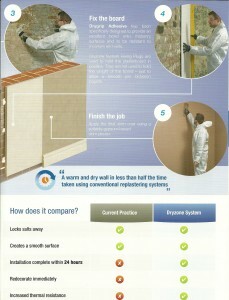 Take a look at the video and discover our new plastering system from safeguard.It saves time and time is money. The usual problem of waiting to redecorate straight away are a thing of the past.Thermal values far out reach that of conventional sand and cement Plastering. For your survey click HERE! Safe Guard |Techniques & Materials to prevent flood damage. 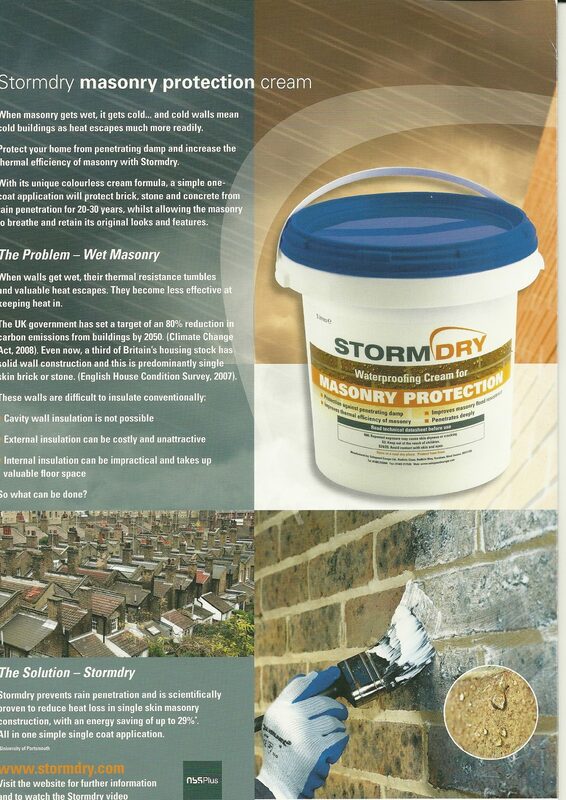 click to download the stormdry_brochure Dampsolved use only the best Techniques and materiel’s,when it comes to your projects,some of the most tested and proven methods come from safe guard and their vast product range. 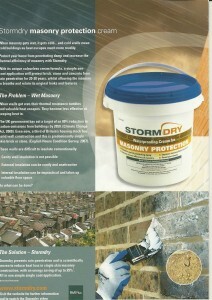 Like the new storm dry product,which has taken the market to new levels of achievement. CLICK HERE FOR YOUR SURVEY! Here are some useful links to help you prepare for flooding. In this blog we intend to help our visitors where ever possible. We Know how tough it can be,when moving house or moving into new premises,only to be greeted with some sort of maintenance problem.We intend to make this as painless as possible. If you have any questions please do not hesitate to call or email our details are on the contact page.Or leave a comment below.